Keeps your liquid-fuel stove running strong. Everything you need to perform annual maintenance on your liquid fuel stove and pump to ensure lasting reliability in the field. Includes O-rings, pump-cup oil, safety pin, and MSR® jet/cable tool—all packed inside a handy plastic case. 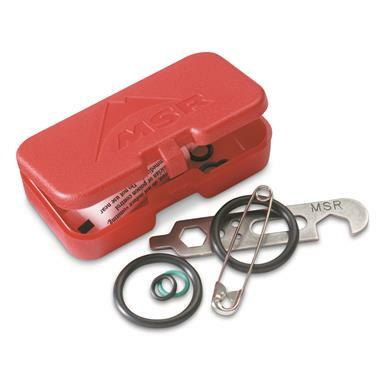 MSR Stove Annual Maintenance Kit is rated 4.7 out of 5 by 19. Rated 5 out of 5 by Chef derek from Worth the money I bought the maintenance kit to maintain my stove. Definitely a resource every stove owner should have. Rated 5 out of 5 by 1der from Go prepaired The contents of this kit won't leave you out in the cold without a stove to heat up your chow or hot coffee. I always carry this with me on an adventure. Rated 5 out of 5 by Bentforkx from Never leave home with out one! Have bought three annual maintenance kits for my whisperlite international stove over the decade I've had the unit. I figured it was due for a little maintenance/up keep after the first four years, and again after the second four years... the third kit I used on the west coast trail. I make a point of carrying the maintenance kit more as a field repair kit, and glad I do. Of course with my recently cleaned up stove, I didn't require it, but my neighbors sure did!! With a little experience, and of course the MSR annual maintenance kit, I had all the things needed to get their stove up and going for the rest of their trip. The MSR maintenance kit save them from relying on the kindness of others for the rest of their backpacking experience, and helped make their adventure a success! Rated 5 out of 5 by ASC9 from Well worth the extra weight I used to gripe about caring this kit with my Dragonfly stove. Man oh Man, saved our butts on our most recent 5 day trip. Ended up doing a full field maintenance on day 2, restored our stove, and allowed us to complete our adventure with hot meals for the remainder of the trip! I'll never leave home without this kit! A must have! Rated 4 out of 5 by Banker from Essential stove maintenance Bought this at Christmas and was able to get the Dragonfly fully functional in no time. Essential kit in winter. Rated 4 out of 5 by Chrispc from Good kit, however... Good kit, although the larger O rings for the fuel bottles tend to wear out faster than the smaller ones for the pump. These used to be available separately. It's a waste of money (and of product components for the manufacturer / retailer) to have to buy an entire kit just for the large O rings. Please sell these separately again. Thanks.